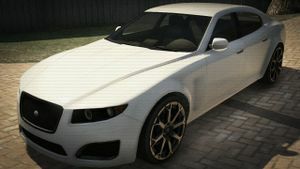 The Lampadati Felon is a foor-door coupe in Grand Theft Auto V.
The Felon is largely based on the 2004-2012 Maserati Quattroporte as seen in the overall design,the side profile and the prominent hood design.It also shares styling cues such as the Jaguar XFR as seen in the front end and tailights of the car. The Felon has good acceleration, especially from a standstill, and an equally impressive top speed, making it one of the fastest four-door cars in the game.It has a better handling than the Ubermacht Oracle. Jackal, a similar sports coupe based on the Jaguar XF. Felon GT, the coupe-cabriolet sport equivalent. This page was last modified on 5 October 2014, at 17:55.